Scripophily News - Collectible Stock and Bond Certificates in the News from around the World! 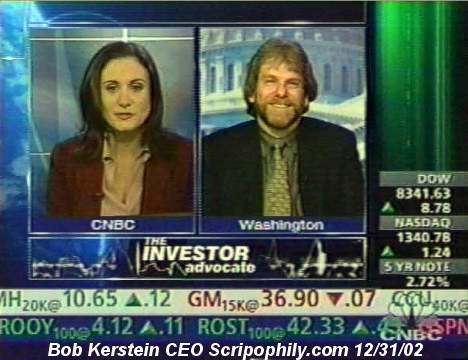 December 31, 2002 - CNBC New Years Eve Show - Bob Kerstein, CEO of Scripophily.com joins Michelle Caruso-Cabrera of CNBC to discuss Scripophily.com's collectible Stock and Bond Certificates. Wednesday, October 9, 2002 - Scripophily.com will be a Co-Sponsor in the Orlando Extravaganza OPEX 2003 Postcard and Scripophily Show in Orlando, Florida January 4th and 5th, 2003. The show is the Biggest and Best Old Paper Show in the South Eastern U.S. - HUNDREDS OF DEALER TABLES OF POST CARDS AND ALL TYPES OF PAPER ITEMS INCLUDING OLD AND MODERN STOCK AND BOND CERTIFICATES PRESENTED FOR SALE BY DEALERS FROM ALL OVER THE WORLD! Monday, October 7, 2002 Palm Beach Post Tyco stock certificate going for $59.95 By Jeff Ostrowski, Staff Writer With shares of Tyco International Ltd. trading around $13, who'd pay $59.95 for a Tyco stock certificate? Perhaps a "scripophilist" -- someone who collects stocks, paper money, letters and other documents of historical import. Scripophily.com of Chantilly, Va., last week offered a Tyco certificate bearing the signature of former Chairman and CEO Dennis Kozlowski, a Boca Raton resident, for $59.95. Scandals boost a company's stock certificates, said Scripophily head Bob Kerstein. But given the rash of corporate malfeasance in the past six months, Tyco certificates haven't sold as quickly as Enron Corp. shares did this year. The priciest certificate sold by Scripophily was a Standard Oil share signed by John D. Rockefeller and Henry M. Flagler. It fetched $8,500 -- and proved that, even for scripophilists, corporate crime doesn't always pay. September 27, 2002 Chicago Sun Times Lifestyles of the rich and obscure BY CHRIS WHITEHEAD BUSINESS COPY EDITOR The economy may be stuttering, but a guy in Texas still came up with $44,000 for a big E that Enron used to have outside one of its Houston offices. And in Australia, a grocer paid a record $20,000 for the first tray of this season's mangoes--a fruit that usually sells for about $40 a tray. Both men were bidding at auctions--in Texas at Enron's garage sale and in Australia at a fund-raiser for a children's hospital. .....Paper profits Martha's troubles are probably good news for Scripophily.com, too. The seller and researcher of old stocks and bonds will sell you a pair of stock certificates--ImClone and Martha Stewart Living--for $89.95. More interested in Enron? They'll sell you that, too, and for less than 44 grand. September 21, 2002 WASHINGTON DC.- SCRIPOPHILY.COM WILL ATTEND Washington Historical Autographic and Certificate Organization Show On November 9th 2002 in Tysons Corner, Virginia - The Washington Historical Autographic and Certificate Organization is bringing together, on November 9th 2002, collectors and dealers of Scripophily from across the country. Scripophily.com will have a large display of Modern Stocks which is one have the fastest growing areas of the hobby. Included in this area are certificates from the current Scandals including such companies as Enron, Worldcom, Adelphia, ImClone, Martha Stewart, Rite Aid, Tyco International, DrKoop, Egghead, and XO Communications. You will be able to see our exclusive "Insider Trading" and "Modern Scandal" Packages. We will also be premiering our "Disconnected Number" package of failed telecommunication companies. This exciting show and auction will be held at the Westpark Hotel in Tyson Corner from 9 am to 5 pm. Thursday, September 12, 2002; Page E05 Washington Post - For Some E-Commerce Sites, Modesty Is the Best Policy By Ellen McCarthy -Falls Church-based Scripophily.com, for example, which sells stock certificates and other corporate memorabilia, is humming along nicely, said founder and chief executive Bob Kerstein. Kerstein never intended to create a mega-corporation with thousands of employees. In 1996, after holding jobs with several public companies, he envisioned a start-up that could provide him a modest but steady living. By doing much of the grunt work himself and keeping costs minimal, Kerstein has kept the private business profitable and able to support its four-person staff, he said. "The biggest key to the success is that we are doing it ourselves, not outsourcing the marketing, Web development and advertising," he said. "Had we outsourced it, we would have been bankrupt 10 times over." 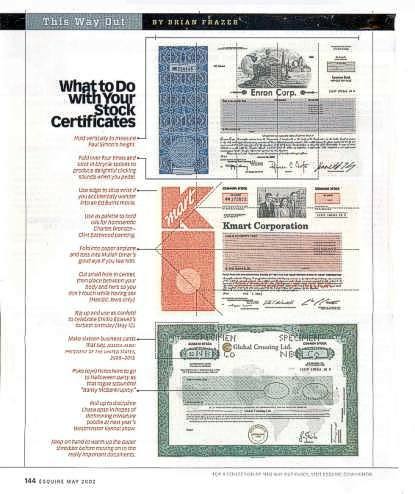 THE WALL STREET JOURNAL Wednesday, September 11, 2002 By AARON ELSTEIN Investors Find Certificates Are Still Worth Something .....Indeed, stock certificates may get scarce soon. The New York Stock Exchange said on July 30 that member companies no longer need to issue certificates, ending a decades-old rule. The Nasdaq has never had a rule requiring members to issue certificates, a spokesman said......Bob Kerstein, chief executive of Scripophily.com LLC in Chantilly, Va., says that a certificate issued by Merrill Lynch in the 1970s is becoming of interest to collectors. The reason: The certificate contains a depiction of the World Trade Center. 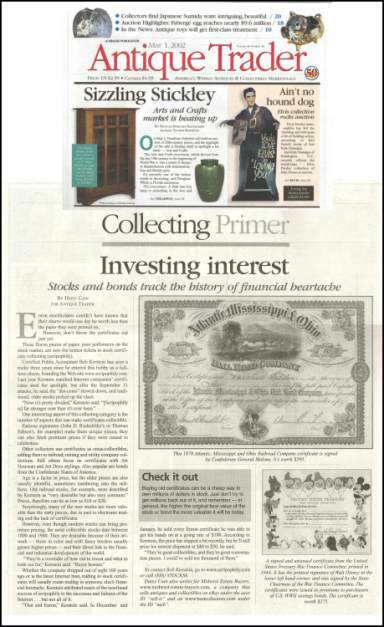 Kiplinger - September 4, 2002 COLLECTIBLES - Coins & Stock Certificates - If the company is long gone, a stock-certificate collector (called a scripophilist) may still be interested in it as a collectible....visit Scripophily.com and the Washington Historical Autograph and Certificate Organization. 8/27/2002 The Buffalo News Adelphia stock worth big bucks to collectors By FRED O. WILLIAMS News Business Reporter Adelphia stock only fetches 14 cents on the over-the-counter market, but there's still a place where it's worth $80 a share. Actually the price is $79.95, and the place is Scripophily.com, a company in Falls Church, Va., that makes a market in the stock certificates of infamous companies. Reuters - August 20, 2002 - By Christopher Doering - WASHINGTON, Aug 20 (Reuters) US corporate scandals create new collectors' market - As investors have watched their portfolios plunge in the wake of corporate mischief sweeping Wall Street, collectors have snapped up anything associated with beleaguered companies ....Stock certificates have garnered the most attention as they offer the best long-term "investment" for collectors. ...Kerstein's Scripophily .com is selling its "Insider Trading" package of certificates from ImClone Systems Inc IMCL.O . and Martha Stewart Living Omnimedia MSO.N for $90. Dateline ABC SUNDAY, JULY 28, 7:00 P.M. 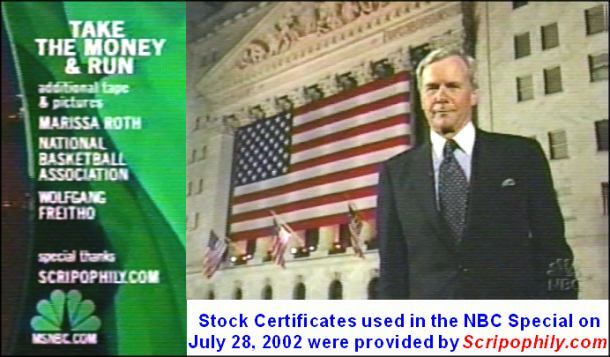 ET - Take the Money and Run NBC Anchor Tom Brokaw reports for a one-hour Dateline special, “Take the Money and Run - Major Scandal Stock certificates for the special supplied by Scripophily.com. 26/07/2002 Réseaux & Télécoms Violente remontée des actions Worldcom et Enron Marc OLANIE - Qwest, Worldcom, Kmart, MCI, Enron, rien que du beau linge –devrait-on dire linceul- réuni dans un « Modern Scandal Package » vendu pour la modique somme de 300 $ (offre promotionnelle, prix public 530 dollars). July 9, 2002 - Jay Leno Show "Let me ask you: Anybody got a Martha Stewart stock certificate? I'll trade you two WorldComs and an Enron for it, if you have one!" July 9, 2002 - David Letterman Show "By the way, before I came out here, I received a phone call from Martha Stewart and she asked me if I would make an announcement for Martha. And she just wants all of her stockholders to know that those stock certificates can be made into lovely place mats." June 12, 2002 Norway Bilverden:Packard skal gjenopplives - Hjælp! Eller hvis du går til en annen site jeg har stor glede av, http://shop.store.yahoo.com/scripophily og derfra banker deg inn på biler, vil du blant annet se at et nydelig, gammelt aksjebrev fra Packard vil koste deg under 40 dollars. Monday, 8 April, 2002 BBC News - Worth the paper it's written on?...The art of share certificate collecting is called scripophily and it's quite a little hobby. Friday, March 29, 2002 - The Sacramento Bee - Jack Sirard - From the amount of mail I've been getting on this subject of late, it looks as though more and more people are treasure hunting in their attics.....Scripophily.com (www.scripophily.com) wheels and deals in historic stock certificates. Scripophily is the formal name for collecting antiquated stock certificates. Scripophily.com has been in business since 1996 and bills itself as a leading provider of collectible stock and bond certificates and other old paper items. It also provides research information on old stocks and companies. The toll-free number is (888) 786-2576. 07-Mar-2002 FEATURED PROGRAMMING E*TRADE Financial Daily Pack rats unite: Collecting old stock certificates (8:03) host Jonathan Hoenig and WebFN News Anchor Tom Hudson talk about this unusual hobby with Bob Kerstein, CEO of Scripophily.com. 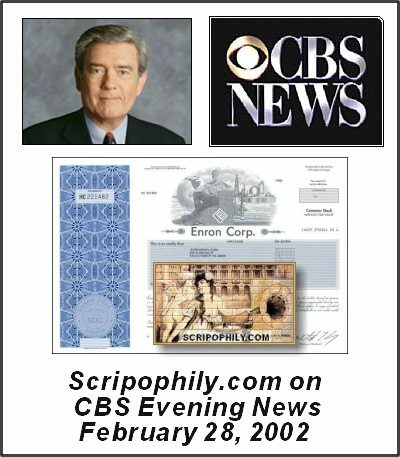 February 28, 2002 - CBS Evening News - Dan Rather reports "...Enron's actual stock is selling for less than the paper its printed on at $100..." with a certificate image provided by Scripophily.com and held by Bob Kerstein, CEO. January 16, 2002 - The Christian Science Monitor By Ron Scherer and David R. Francis Lessons of Enron: How could no one have seen it? ...The degree to which Enron has fallen is summed up by the fact that its stock may now be worth more as a souvenir than as a certificate of ownership. Bob Kerstein, an accountant and financial historian, is offering Enron stock certificates on his collector web site, Scripophily.com, at $100 a pop. Or he was - right now he's sold out. 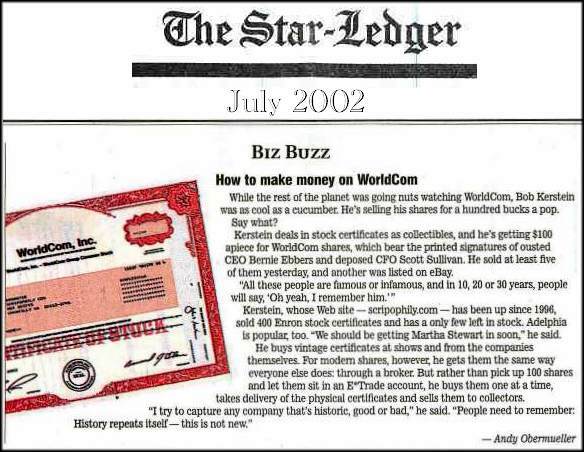 January 11, 2002 - Houston Business Journal - Enron Corp.'s stock price has been reeling in the range of 66 cents to start the new year, but there's still one place where a share of the fallen energy giant commands .... A "beautifully engraved certificate" of Enron stock last week was priced at $99.95 on Scripophily.com, the Old Stock Superstore. "We are currently sold out," notes Scripophily.com. "But we expect to receive some more." January 3, 2002 KLIF Dallas Radio Station Ankarlo Mornings Darrell's first week at KLIF Enron Stocks are Collectors' Item guest: Bob Kerstein - president of Scripophily.com - Note: We are about 32 minutes in the show. 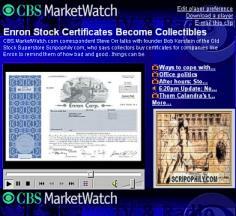 January 4, 2002 - CBS.MarketWatch.com correspondent Steve Orr talks with founder Bob Kerstein of the Old Stock Superstore Scripophily.com, who says collectors buy certificates for companies like Enron to remind them of how bad and good...things can be. © 1996 - 2003 Scripophily.com ® LLC, Scripophily.net, Wall Street History - Lost and Found (sm) All Rights Reserved. You may link to the site, but do not copy any images or information without our expressed written permission. Thank you! Scripophily.com ® is powered and designed by Bob.com. If you have any questions, or want to know more about our Corporate Employee and Executive Gift Programs , please send us an Email or call our toll free number at 1-888-STOCKS6 (1-888-786-2576.) or direct 703-579-4209.